MAN’S mastery of mechanics which brought about the machine age of today dates back thousands of years to the first machine age when primitive men discovered and applied the two basic principles of mechanicsâ€”the lever and the inclined planeâ€”and then invented and used the six elemental machines: the lever and the inclined plane, the wheel, the pulley and the axleâ€”all modified forms of the leverâ€”and the screw, an adaptation of the inclined plane. 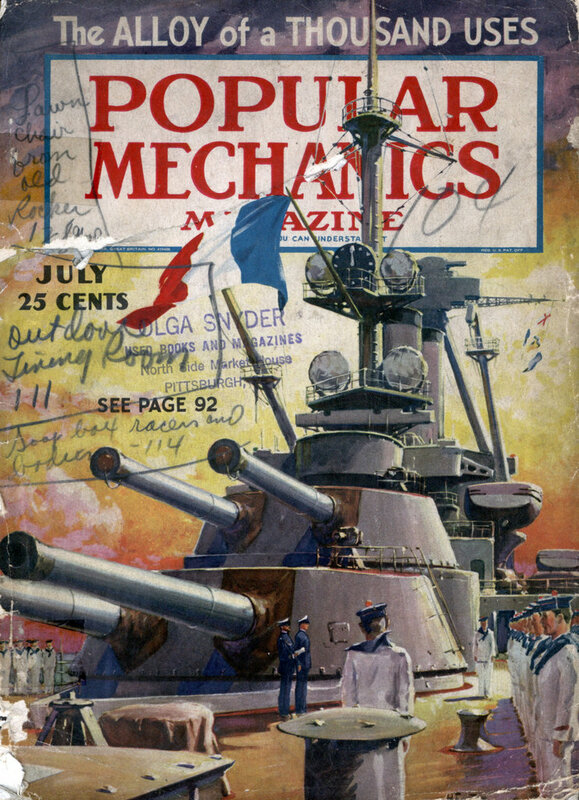 Today, in the Seymour H. Knox Hall of Civilization at the Buffalo Museum of Science a unique exhibit titled “Mechanical Power” pays proper tribute to the ingenuity and inventiveness of the ancients. Miniature figures are portrayed using models of the rough, crude, but highly important machines of the first machine age. As the sub-title of the exhibit explains it: “The discovery and application of simple mechanical principles made possible tasks to which muscles alone were unequal.” Thus even primitive man proved the superior power of brain over brawn and paved the way for the machine age of today. One of the two basic mechanical principles, the inclined plane, was originally and most simply applied in the form of a wedge. Every cutting tool is a wedge. Early man’s stone axes, arrow heads and spears, modern man’s razor blades and surgeons’ scalpels, carpenters’ saws and files, rotary knives and high-powered lathes that cut hundreds of feet of steel a minute by means of a fixed wide-angled wedge called a cutter bitâ€”all are wedges or combinations of wedges and all operate precisely on the basic mechanical principle of the inclined plane. Shears and scissors are pairs of wedges pivoted together. Each of the hundreds of teeth in a lumber mill saw is a wedge. The mechanical jack-of-all-trades, the most versatile of all the mechanical elements, is a highly modified form of the principle of the inclined plane, the screw. When we make hash we first screw the meat grinder to the table and we feed the ingredients to the grinding knives, wedges, by the way, by means of a revolving screw. To exert powerful pressure or to fix in place firmly we use a screw. To measure in millionths of an inch, science and industry use screws. The section of a screw pulls airplanes through the air and the same simple elementary machine propels the gigantic ocean liners. The other of the two basic mechanical principles, the lever, in one exhibit is shown, counterweighted at one end, being applied by a primitive maid to draw water by means of an ancient well sweep. The identical principle is applied today in the bridge-lift. A shovel is a lever and nothing else. The most important modification of the lever and one of the most important of all machines is the wheel. Equally important is the use of the wheel for transmitting power and for motion. When wheels are connected by belting, the transmission of power is made possible. When two revolving parts, or wheels, must bear a fixed ratio of movement to each other, man fits the faces of the two wheels with teeth, wedges again, and calls them gears. Gears drive the works of the tiniest wrist watch; gears crush the toughest cane sugar. The wheel also is used to store energy. This is the flywheel used to smooth out pulsations in all sorts of machinery from automobile motors to pumps in city water works. This is also the gyroscope used by aviators and the gyroscope that minimizes the rolling of ocean liners. Another modified form of lever is the pulley. An exhibit shows early man using the pulley in its simplest form. No mechanical advantage is gained. 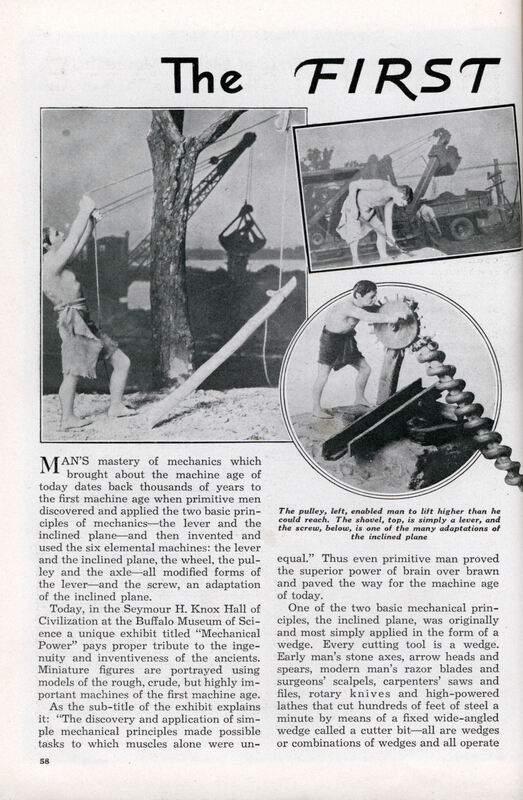 The man had to pull down on his side of the pulley just as hard as the timber pulled down on its side. But this early pulley enabled early man to lift an object far higher than he could reach. The modern dredge silhouetted in the background is using precisely the same application of the pulley, but, instead of using only one single-wheel fixed pulley, it uses a set of double or triple pulleys to enable man through mechanics to reach down deep into the depths and on to the bottom of a harbor, lake or river. Today the pulley is as important in engineering as it was along the Nile 4,000 years ago. The use of two or more of the six mechanical elements in the same mechanism was the dawn of more complicated and far more efficient machinery. An exhibit shows primitive man and one of his first more complicated machines, an endless-chain bucket pump, utilizing the lever and the wheel, as well as the idea of continuous motion, to raise water. To exert continuous pull or pressure man early applied the idea of continuous motion in the form of a crude capstan as shown in an exhibit with a present-day steam winch silhouetted in the background. Both the ancient capstan and the contemporary steam winch operate on the selfsame principle. Thus the most up-to-date machine of today, complex and complicated as it is, dissimilar in appearance though it may be from the mechanical contraptions of the first machine age, nevertheless operates on exactly the same mechanical principles the discovery and applications of which enabled primitive man to proclaim his emancipation from brawn as the sole source of power with which to provide himself with food, shelter, clothing and protection from his twin foes, the elements and the animals. For thousands of years man’s mechanical ingenuity and inventiveness for the most part has expended itself in devising new combinations and modifications of the six crude contraptions of the first machine age. In the thousands of intervening years there has evolved one radical change, a change just as important as the original discovery of the two basic mechanical principles and the six elemental machinesâ€”the substitution of motive power for brawn power to run these machines. Windmills and water mills were the first steps in the solution of man’s power problem. Then, in 1765, one man with one invention literally made over the world. So much so that it has been truthfully written: “All the brawn of all the millions of men who lived before 1765 did not change the world as much as did the idea of one brain in the 171 years since. This is the measure of brain versus brawn.” The man was James Watt. The invention was the steam engineâ€”the first paragraph in the final chapter of the book of man’s complete freedom from the serfdom and slavery of human brawn power.